The partnership I’ll write of today was that of Jack London and his second wife Charmian. Charmian, an adventurous, progressive woman with a ready laugh, captivated Jack London, an advocate of women’s equality. He referred to her as his “Mate Woman.” Although some friends criticized her as too plain, she suited him. She proved a good companion on their South Sea voyages, and a help to his writing. He had already become famous as the author of Call of the Wild when they met. She typed manuscripts and business letters, and, as an accomplished pianist played Chopin and Lizst to accompany London’s writing hours. On the edge of the Sonoma Valley in California’s wine country is what is now Jack London State Park. There, the Londons once set out to build what Jack called “my dream house on my dream ranch.” He thought that barring an act of God it would last 1000 years. Instead, the Romanesque mansion of stone and redwood burned one month before the London’s were to move in. He died shortly thereafter at age 40. Charmian built a more modest home on the ranch that also served as a museum for artifacts of their travels and London’s life and writing career. She never remarried. Their partnership was a short union of soul mates. 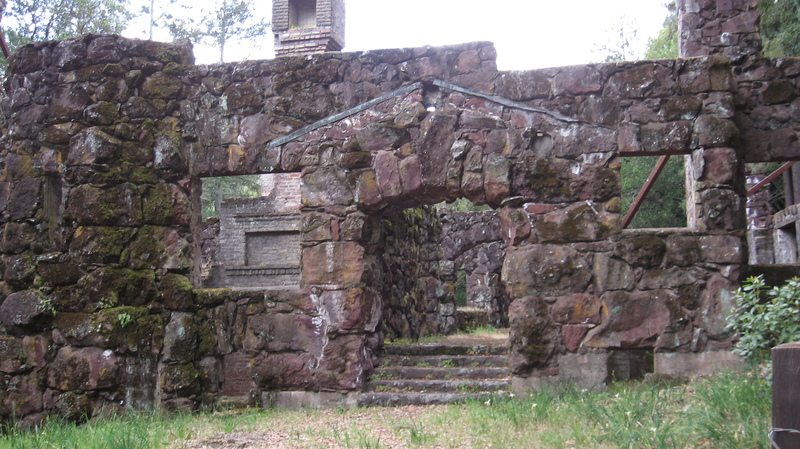 After her death, her ashes were buried next to his, the only marker a red stone from the beautiful ruins that rises among the old madrone trees in one of the most peaceful settings one could imagine. Writers who have supportive partners are truly blessed. This entry was tagged Karen Wills. Bookmark the permalink. I am glad you are reliving your grand adventure by blogging it. So well written. Thanks for sharing. Thanks, Marie. I had fun writing it. It’s an amazing place. I felt London’s bigger than life presence there the whole time.